"Working with a quintet of agreeable young performers, director Stafford Arima moves the show along gently yet briskly." "Credit is due to director Stafford Arima, who has these young people drilled without showing a hint of stiffness." Presented by: Carolyn Rossi Copeland and Marie B. 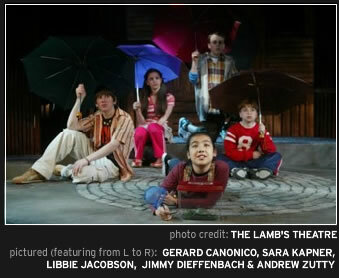 Corporation Broadway Overseas Management, in association with the Lamb's Theater Company.